Jazzmania Ragdoll Cattery is nestled in the woods along the beautiful Susquehanna River between Lancaster and York, Pennsylvania. 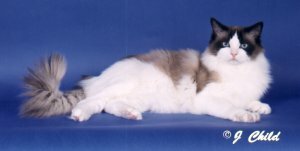 I have been dedicated to breeding beautiful, loving and healthy Ragdoll babies since 1996. Raised underfoot in my home, each kitten is ready for adoption at 12 weeks with a health guarantee by contract, vet-checked, fully vaccinated, dewormed and spayed/neutered. Simply provide a loving home and be prepared to experience the joys of being owned by your very own Ragdoll kitten! The name "Jazzmania" is in honor of my foundation male, Jazzy Jewel, pictured above. He was a gorgeous boy with that floppy, laid-back Ragdoll temperament and sired many beautiful, healthy babies just like himself over the years - thus the "mania" in Jazzmania. See the "Tribute to Jazzy Jewel" link for more on this beautiful Ragdoll's life. Please browse Jazzmania's website and enjoy the information and pictures provided within. There is information about the Ragdoll breed as well as info regarding Jazzmania’s cats and kittens and how you may adopt one of your own! All content on this page and the pages linking from it are copyright © Joyce Houser. All rights reserved.